Explore a new way to re-imagine and honor those treasured ocean finds! 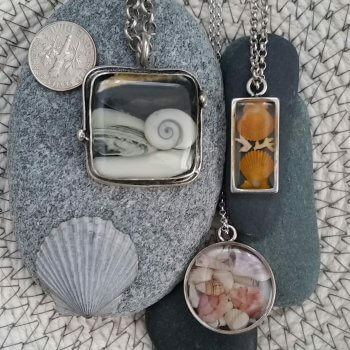 Students will design and finish three beautiful mixed- media “shellscape” collages arranged in silver-plated pendants using miniature shells and shell pieces. Learn two techniques and combine them to create three different designs. Additional materials will be available for purchase to create more pendants outside of class, at your leisure. All materials provided but feel free to bring your favorite small shells and treasures to personalize your pendants. Shaari, a graduate of Pratt Institute, has worked as a professional artist in many media for over two decades. Shaari is best known for her hand-painted, gilded wood bowls, made by her husband Alistair Jones, a master furniture-maker. This work is based on an old world color palette, with patterns & imagery stemming from classical sources including medieval manuscripts, ancient textiles, & the Frescoes of Pompeii. Like many artists, a constant drive to experiment and explore new interests has led Shaari to the art of jewelry making. Guided by her love of the ocean she developed a unique way to combine all her skills to create original mini-seascapes as wearable, one-of-a-kind pendants.